My conversation with ckbk founder Matt Cockerill. Matt: Hi, I'm Matt Cockerill, the founder of ckbk, ckbk.com, which puts the world's best cookbooks at your fingertips. Suzy Chase: Just as Cookery by the Book podcast filled the space for a podcast devoted solely to cookbooks, ckbk fills a very specific niche. Walk me through your research, what you found out there, and how you came up with this particular concept. Matt: The background to ckbk really is a frustration that both printed cookbooks, and the online experience of searching for recipes online were both missing something. Each was part of the solution, but each had its own challenges. So I have a huge collection of cookbooks, and they sit there on the shelf and they're beautiful, and I know they're full of great content and I can browse them and discover some of that, but it's very frustrating not to be able to search them, to filter them, to find specific things, and certainly they're not always there when I need them. And then going online there is a different challenge which is; there is good material online, but there's also a lot of material that's not so good. It's very difficult to sift through to find the best recipes, and there's some really key material from the best cookbooks which simply isn't online at all. And so what we recognized is that there's an opportunity to bring that really high quality, reliable, tried and tested cookbook content online, bring it together in one place, and create a service which lets people discover really good, personal recommendations for what they can cook, in a way that hasn't been possible. Suzy Chase: What's an example of key material that's not online, you mentioned key material. Matt: So to give you a simple example. If you care about French cooking, the definitive resource on French cooking is Escoffier. And that book and the way in which it structures classic French cuisine, actually simply hasn't been digital at all, it's not been possible to search Escoffier. And so, many, many things refer back to it and build on it, and take it in new directions, but it's a source material which is really critical to that classic French cuisine. And so, that would be one example of material which, having it all in one place is really valuable. Suzy Chase: Now, how many cookbooks will we be able to access on the website? Matt: So we've already licensed well over 500 cookbooks, and we're bringing those all together, there are nearly a hundred already available through the site which is in beta testing right now, and by the time we are commercially launching in October we'll have more than 100,000 recipes. So there's a huge collection, larger than any of the major websites right now have brought together, and with a much more diverse range covering all the world's different cuisines, and covering everything from really easy weeknight recipes to the most sophisticated chef dishes, and professional reference works. Suzy Chase: How do you choose the cookbooks? Matt: So that was our real starting point for the project, was to figure out what is the material with real long-term value, what are the classics, what are the things which have really influenced cooking. And so we started with that by asking leading chefs and cookbook authors, what where their top ten cookbooks, what were the books that they kept going back to? And by compiling hundreds and hundreds of those top ten lists, we've been able to build a picture of the most significant culinary works, and so that was what guided our process of licensing. We approached both many publishers, who have some of those works and also individual authors, and the estates of authors. Some of these works, they span many decades, and so we've done lots of detective work researching the rights, getting in touch with authors, for example Graham Kerr, the Galloping Gourmet, he's up in Washington State and we've been able to license some of his really interesting classic works from the '70s, as well as working for example with contemporary publishers, Workman for example, and Houghton Mifflin Harcourt, who've licensed some of their classic works to us to, and also, some of their very latest titles. Suzy Chase: That's so cool. So speaking of licensing, lately in the cookbook community there's been some buzz about compensation. Talk a little bit about compensation structure for cookbook authors featured on your website. Matt: So, the interesting thing about traditional print publishing is that there's quite a short window of time within which most authors are generating income and revenue and royalties from their cookbooks, because it's primarily coming from print cookbook sales, and books tend to sell most of their copies in that first year or two following publication, and that's when they get all the marketing effort from the publishers too. And what that means is, even really well-known books, after a few years, even though they're still being used, they're not generating any additional revenue for the authors. And that's unlike the situation say with musicians, where as long as the music's still being played on the radio, they're still earning those royalties. And so this transition in terms of being able to create a platform like ckbk, where the usage is tracked and we pay out royalties in proportion to usage. So these examples of cookbooks which go on to be really trusted and used for many years after publication, through the ckbk model, it creates an additional revenue stream for authors, which has the potential to last and be more significant. Because right now, what tends to happen is those popular classic works really circulate as secondhand copies through Amazon, and of course, however many people buy a secondhand copy on Amazon, that's not generating a penny of revenue for the original author. Suzy Chase: That's so interesting. Matt: And we also hear from a number of authors, they get approached by readers who ... The really best cookbooks that get heavily used, they fall apart, and people are looking to get hold of copies, but because of the economics of print, it's quite difficult for publishers. Only a small fraction of cookbooks stay in print or get reissued, and so authors are often hearing from readers who are frustrated that it's quite challenging to get hold of another copy of their favorite cookbook. So to be able to bring these works back online and to help to make them also more discoverable, so that people can find new authors, rather they can discover for themselves authors which are new to them, but they may find them through recommendations. So we for example have a top ten from Nigella Lawson, the site we created for the recommendations from leading chefs and authors, and there's some really interesting books which she recommends, from Anna Del Conte, Peter Reinhart, and people might not have heard of those authors but it becomes really interesting when you realize, okay, so this clearly are influential. Anna Del Conte is the authority in the UK on Italian cuisine and it really makes sense to find out more about Italian cuisine by reading her work. And so those kind of recommendations are playing a key role for us, in helping people discover new authors and recipes. Suzy Chase: Other than the recipes and recommendations, what are some other features that we can expect? Matt: So one of the key things is to be able to slice and dice and filter results in a really flexible way. So for example, we hear a lot from vegetarians and vegans who are frustrated that there are lots of good cookbooks out there, but they might only have a small fraction of recipes which are suitable for them, and not only is it wasteful to have to buy the whole cookbook, but then it's difficult to search and find things. With our whole database built from these hundreds of cookbooks, it's very easy to take any search and filter it to find recipes to satisfy a certain set of dietary requirements. But then also to filter, so say you've searched for a particular ingredient, like aubergine, and say, do I want to do something with this, but maybe I want to filter it to look for some Chinese ideas or some Mediterranean ideas. And because we'll be bringing everything together in one place, there's a lot more flexibility then to explore in different directions. Suzy Chase: On your website it says, "ckbk's recipes are tried, tested and edited, taken from cookbooks created by professional food writers and chefs. They won't let you down." Now, are you tweaking existing recipes for the website, or are these straight out of the cookbooks? Matt: We are not editorially changing the recipes themselves at all. We are delivering the recipes formatted to suit the specific device, be that a phone, or a tablet, or a laptop. But the content remains the same, that's what's been edited and tested. On the other hand, we also will be enabling users to share their own tips, hints and comments. So if a number of people find with a particular recipe when they're making maybe a British recipe but in America, with American ingredients, maybe they have a different experience and they try one thing but it works better if they substitute something else. Those kind of tips can be really valuable, and that's where the community of users we think will really be able to add value to these recipes. And that also applies to some of the older content. So there's lots of really interesting ideas you can get from looking back to earlier eras and ideas from cookbooks published in the 19th Century, for example. But often they take some adaptation in order to make those recipes work with modern ingredients, again, really useful so that people can share their own experiences, share the results in terms of their photos as well. Suzy Chase: I love that you're creating community around cookbooks, I always find that it's very solitary when I'm flipping through a cookbook, I wanna say, "Hey, what do you do with that? ", but there's no-one to ask about. So it's cool that you're creating community. Matt: We think that's really central, and it's both amongst the readers, who share a common bond of really loving a certain cookbook, and it's also helping to build the relationship between the authors and the readers. So we think that whereas, when an author publishes a print book it may be only through occasional signings and readings that they might get to engage with their readers; by bringing the cookbooks together and the readers together and allowing them to share their own experiences, there's a real opportunity there for authors to see how their books are being used, to see how their readers are responding, and we think authors and publishers will gain a lot from having a much clearer view of how cooks are using those cookbooks. Suzy Chase: So describe the experience, cooking from ckbk, as opposed to a physical cookbook, sitting on our counter, where we can manually flip through the pages. Matt: So there's different ways you can use it. Some people for example might prefer to use ckbk partly to casually explore and browse and come up, find ideas; some people might be using it not necessarily cooking directly the exact recipes with the precise ingredients, and they might be using it more as a kind of tool for exploration; and other people might do that, but then choose to print out certain recipes which you can do too. But then of course, it's very much also designed for using right there in the kitchen, a tablet works really well, so that you can, having found that particular recipe, it's all formatted appropriately to your device and unlike a print book, you can obviously wipe clean your tablet if it gets things on it. So ironically, people originally maybe worried that using devices in the kitchen would be less tragic, but in fact, as cookbooks have become more and more beautiful, well-produced print things, they are less and less compatible with a sort of rough life in the kitchen, if you like. So it's actually really handy to be able to instead, just have a somewhat sacrificial device in your kitchen to use for searching and displaying recipes. And over time, as well, we certainly will be introducing integration with things like the Amazon Echo, and potentially also with smart kitchen devices, so whether it's reading out the next steps for a recipe, or setting the oven in advance to the right preset, these are all things which because we have the structure of the recipe captured, we can really help to make the process a lot smoother. Suzy Chase: It's not like you can't get the physical book, you can still get the physical book, add it to your collection, but you can still go to ckbk.com and cook out of that. Matt: Right, and so I think gradually as well the publishers ... Some of the publishers were a little bit cautious to start with, but that's because they were always like, "Even if this is really successful, the thing about print is we know it works and we know we're happy with how that business works." But I think what we're going to see, is that the two things together just really come up with a great synergy, and you discover new things, and you say, great I should really get a copy of that and give that to somebody, or get a copy for myself. And so, it's actually gonna really just build the whole world of food publishing, to be much more successful. It just makes it fit better with the modern world. You want to be able to enjoy a really beautiful print book, but you don't want to have to not be able to search it, to not be able to use it wherever you are. Suzy Chase: It's so smart. Suzy Chase: So ckbk was listed on Kickstarter under their category, Project We Love. Which is amazing. Talk about your Kickstarter campaign. Matt: So, as you described, we'd been always thinking that bringing people together around cookbooks is pretty central to what we're aiming to do with the ckbk service. And so, we thought that Kickstarter would be a great way to do that and to bring in founder subscribers who we wanted to give early access to, so they could help us to really make the most of the service and to guide us as to how it could be most useful to them. And as we built the original website to explain the whole vision of ckbk, we were amazed at the feedback we got, just how enthusiastic people were, and in particular, how much we were told, this is just something we've been waiting for, and we can't quite understand why it doesn't already exist. And so that was really positive to hear, and I think that exactly, there has built up, as in other areas like music and film, as the advantages of being able to subscribe with a flat monthly fee, and then really have the freedom to explore and discover new things, they really enjoy that way to access new content. And so we've been looking forward and realizing that this could work as such a great fit with food and cooking. And so we opened it up so that people could sign up as founder subscribers and get a really good discount on a 12-month subscription, and it's been great. It took us less than three days to hit our target and we're halfway through the Kickstarter, we've got close to double already, so it's been going really well. Suzy Chase: When does the full website launch? Matt: So we are aiming to launch our early access, for founder subscribers, in September, and then October or November is when, with at least 100,000 recipes, we'll be opening up for regular subscribers. Suzy Chase: Where can we find you on the web and social media? Matt: So, yeah, ckbk is pretty easy to find, we're on Twitter, Instagram, and at ckbk.com. And so that's probably the best place to track us down. 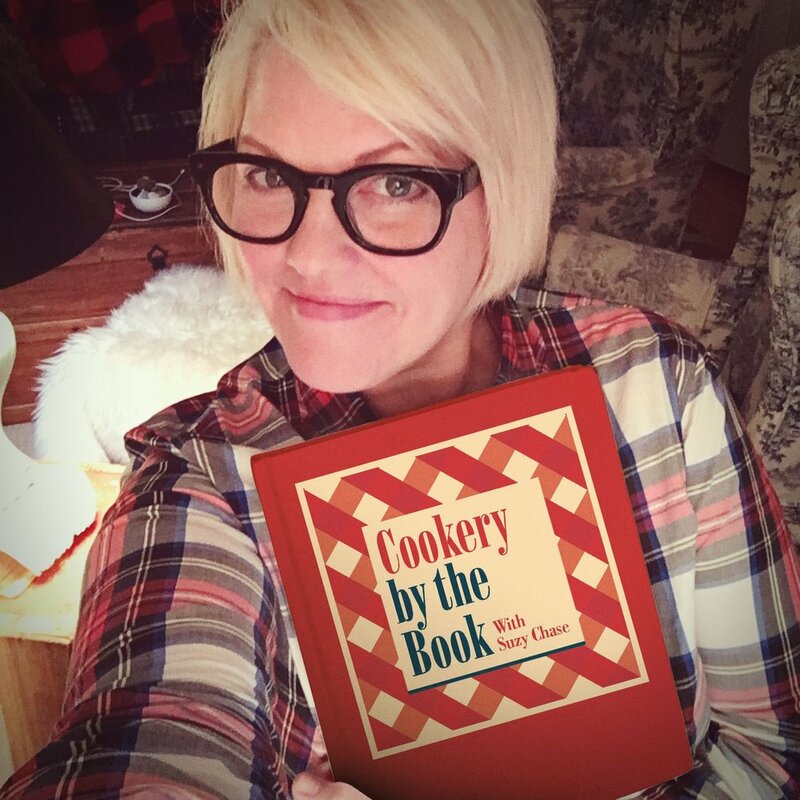 Suzy Chase: Thanks for chatting about the Spotify of cookbooks, and thanks for coming on Cookery by the Book podcast. Suzy Chase: Subscribe in Apple Podcasts, and while you're there, please take a moment to rate and review Cookery by the Book. You can also follow me on Instagram @cookerybythebook; Twitter is @iamsuzychase; and download your kitchen mix tapes Music To Cook By on Spotify @cookerybythebook.